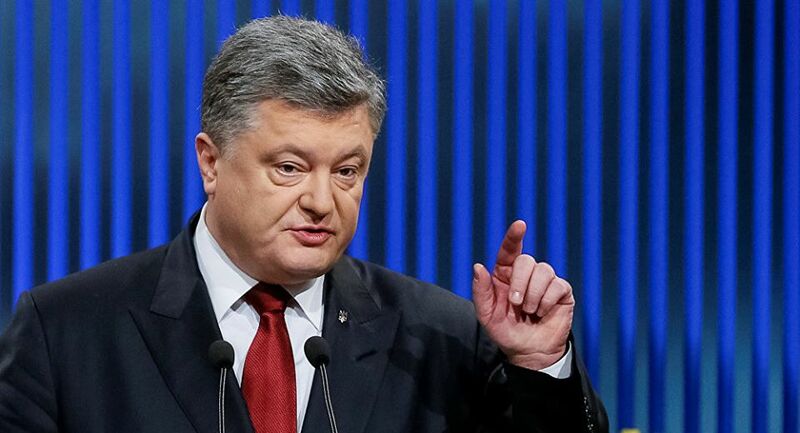 At the Munich Security Conference, President of Ukraine Petro Poroshenko accused Russia of trying to “destroy democracy” and stated that the Russian flag “should not be flown anywhere”. “Neither politics nor business can exist separately from values. In today’s politics in Moscow there is no place for fair play. That’s why the Russian flag does not fly at the 2018 Winter Olympics.” said Poroshenko. “The Russian flag should not be flying anywhere while Russia continues to incite a worldwide hybrid war, and Russian bullets are aimed at our symbols.” he concluded. Thousands of US and German troops, along with tanks and equipment, are being sent to Poland and countries bordering Russia, purportedly in “defense against Russian aggression,” author and journalist David Swanson told RT. Europe is preparing to counter a perceived ‘Russian military threat.’ NATO countries in the East of the continent are awaiting the arrival of thousands of American soldiers as a part of a US-led battle group. The troops will be stationed along the Russian border from Estonia to Bulgaria. Hundreds of American tanks, trucks and other military equipment have arrived at the German port of Bremerhaven to be transferred to Eastern Europe as part of NATO’s buildup near Russia’s borders. The Resolve cargo ship arrived on Wednesday, while two more vessels – Freedom and Endurance – are expected in Germany on Sunday, Deutsche Welle reported. The unloading of the ships began on Friday, with the heavy equipment to be transported to Poland via rail and road. The US plans to deliverer a total of 87 Abrams M1A1 tanks, 20 Paladin artillery vehicles and 136 Bradley fighting vehicles to Eastern Europe, according to Reuters. Four thousand American troops will reportedly be spread across Poland, the Baltic States, Bulgaria and Romania where they’ll remain on rotation basis. Polish and US troops are scheduled to hold joint “massing” drills in Poland later this month, which NATO says is aimed at reassuring its European allies in the face of what it calls aggressive Russian behavior. The 10th Combat Aviation Brigade, with 50 Black Hawk helicopters, 10 CH-47 Chinook helicopters and 1,800 personnel, as well as a separate aviation battalion with 400 troops and 24 Apache helicopters are also scheduled for deployment in Eastern Europe. Estonia, Latvia and Lithuania will host troops from Germany, Canada and the UK, with each nation sending up to 1,000 servicemen. NATO calls it military buildup near Russia’s borders a defensive measure, claiming it is justified after Moscow’s reunion with Crimea in 2014 and its alleged involvement in the Ukrainian crisis. Russia views the military bloc’s actions aggressive and said the massive military is undermining the security balance on the European continent. In November 2016, the Pentagon shipped more than 600 containers of ammunition for Army and Air Force units in Europe, according military.com, marking the largest single shipment of US ammunition in more than two decades, the website reported. Moscow has responded by stationing its most modern weaponry and armaments on its western borders, including the enclave region of Kaliningrad, and staging large-scale military drills on its own territory. Washington opted to speed up the deployment of its troops to Eastern Europe after Donald Trump’s win in the presidential election. Trump, who is to be inaugurated on January 20, has been calling for improved relations with Russia and has voiced skepticism towards NATO, saying European powers would have to contribute a bigger part of the budget if they wanted to continue relying on US protection. Twitter then went predictably nuts, with at least one 49ers fan burning Kaepernick’s jersey. Almost no one seems to be aware that even if the U.S. were a perfect country today, it would be bizarre to expect African-American players to stand for “The Star-Spangled Banner.” Why? Because it literally celebrates the murder of African-Americans. “The Star-Spangled Banner,” Americans hazily remember, was written by Francis Scott Key about the Battle of Fort McHenry in Baltimore during the War of 1812. But we don’t ever talk about how the War of 1812 was a war of aggression that began with an attempt by the U.S. to grab Canada from the British Empire. However, we’d wildly overestimated the strength of the U.S. military. By the time of the Battle of Fort McHenry in 1814, the British had counterattacked and overrun Washington, D.C., setting fire to the White House. So when Key penned “No refuge could save the hireling and slave / From the terror of flight or the gloom of the grave,” he was taking great satisfaction in the death of slaves who’d freed themselves. His perspective may have been affected by the fact he owned several slaves himself. The reality is that there were human beings fighting for freedom with incredible bravery during the War of 1812. However, “The Star-Spangled Banner” glorifies America’s “triumph” over them — and then turns that reality completely upside down, transforming their killers into the courageous freedom fighters. Furthermore, if those leading the backlash against Kaepernick need more inspiration, they can get it from Francis Scott Key’s later life. By 1833, Key was a district attorney for Washington, D.C. As described in a book called Snowstorm in August by former Washington Post reporter Jefferson Morley, the police were notorious thieves, frequently stealing free blacks’ possessions with impunity. One night, one of the constables tried to attack a woman who escaped and ran away — until she fell off a bridge across the Potomac and drowned. You can decide for yourself whether there’s some connection between what happened 200 years ago and what Colin Kaepernick is angry about today. Maybe it’s all ancient, meaningless history. Or maybe it’s not, and Kaepernick is right, and we really need a new national anthem. Breaking: Baghdad State of Emergency, Green Zone stormed. Are Iraqis taking back their country? Supporters of Shia cleric Moqtada al-Sadr have stormed Baghdad’s highly fortified, US established Green Zone, also home to the US Embassy, uninvited, the biggest in the world. 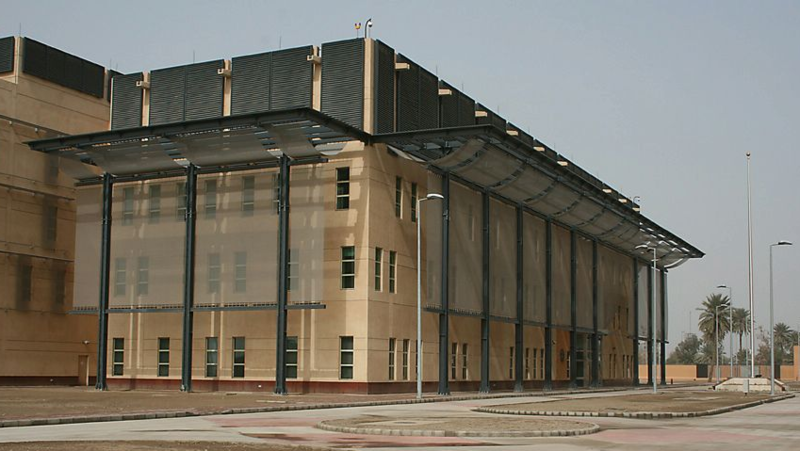 All staff of the Japanese, French, British, Australian, Jordanian, Emirates and Saudi Arabia Embassies have moved in to into the American Embassy, it is being reported. “Iraq’s are very quick to revolt”, former Deputy Prime Minister and Foreign Minister, Tareq Aziz, told me in an interview before the invasion, listing the years and the fate of those the uprisings had been against. The decimation since has delayed a further one, but it seems it’s time has arrived. As for the outcome, updates follow. As we have wondered before in these columns, Embassy roof time for the residents and guests of the US Ambassador – again? Vietnam’s spectre hovers? New sanctions, and once again, new US-ROK military exercises right next door; new intimidations and new insults. For no other reason than because the country that never attacked anyone, is still determined to defend itself against appalling military, economic and propaganda provocations. How much more can one country endure? 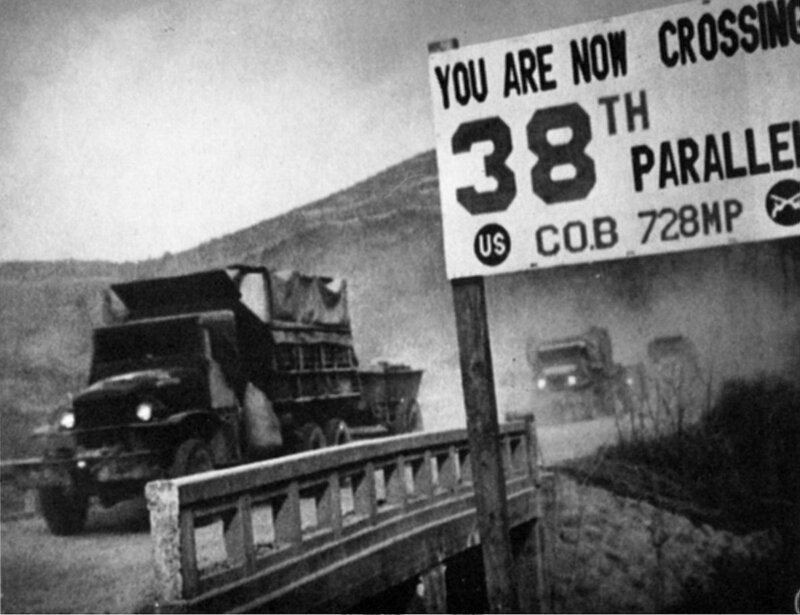 More than 60 years ago, millions of people above the 38th parallel died, were literally slaughtered by the US-led coalition. After that, after its victory, the North Korea was never left in peace. The West has been provoking it, threatening it, imposing brutal sanctions and of course, manipulating global public opinion. Why? There are several answers. The simple one is: because it is Communist and because it wants to follow its own course! As Cuba has been doing for decades… As several Latin American countries were doing lately. But there is one more, much more complex answer: because the DPRK fought for its principles at home, and it fought against Western imperialism abroad. It helped to liberate colonized and oppressed nations. And, like Cuba, it did it selflessly, as a true internationalist state. African continent benefited the most, including Namibia and Angola, when they were suffering from horrific apartheid regimes imposed on them by South Africa. It goes without saying that these regimes were fully sponsored by the West, as was the racist madness coming from Pretoria (let us also not forget that the fascist, apartheid South Africa was one of the countries that was fighting, on the side of the West, during the Korean War). The West never forgot nor ‘forgave’ the DPRK’s internationalist help to many African nations. North Korean pilots were flying Egyptian fighter planes in the 1973 Arab-Israeli War. The DPRK was taking part in the liberation struggle in Angola (it participated in combat operations, alongside the People’s Armed Forces for the Liberation of Angola (FAPLA)), it fought in Rhodesia, Lesotho, Namibia (decisively supporting SWAPO) and in the Seychelles. It aided African National Congress and its struggle against the apartheid in South Africa. In the past, it had provided assistance to then progressive African nations, including Guinea, Ethiopia, Zimbabwe, Mali and Tanzania. The fact that people of the DPRK spilled their blood for freedom of the most devastated (by the Western imperialism) continent on earth – Africa – is one of the main reasons why the West is willing to go ‘all the way’, trying to “punish”, systematically discredit, even to liquidate this proud nation. The West is obsessed with harming North Korea, as it was, for decades, obsessed with destroying Cuba. The West plundered Africa, an enormous continent rich in resources, for centuries. It grew wealthy on this loot. Anybody who tried to stop it, had to be liquidated. The DPRK was pushed to the corner, tormented and provoked. When Pyongyang reacted, determined to protect itself, the West declared that defense was actually “illegal” and that it represented true “danger to the world”. The DPRK refused to surrender its independence and its path – it continued developing its defensive nuclear program. The West’s propaganda apparatus kept going into top gear, spreading toxic fabrications, and then polluting entire Planet with them. As a result, entire world is convinced that the “North Korea is evil”, but it has absolutely no idea, why? Entire charade is only built on clichés, but almost no one is challenging it. “Chapter VII of the UN Charter states that the Security Council can take measures against a country if there is a threat to the peace and this is the justification they are using for imposing the sanctions. However, it is not the DPRK that is creating a threat to the peace, but the USA which is militarily threatening the DPRK with annihilation. The DPRK has clearly stated its nuclear weapons are only to deter an American attack which is the threat to the peace. The US/NATO military bases in Asia (and in other parts of the world) are actually the main danger to the DPRK, to China and to the Russian “Far East”. Enormous air force bases located in Okinawa (Kadena and Futenma), as well as the military bases on the territory of the ROK, are directly threatening North Korea, which has all rights to defend itself and its citizens. It is also thoroughly illogical to impose sanctions on the victim and not on the empire, which is responsible for hundreds of millions of lost human lives in all corners of the Globe. 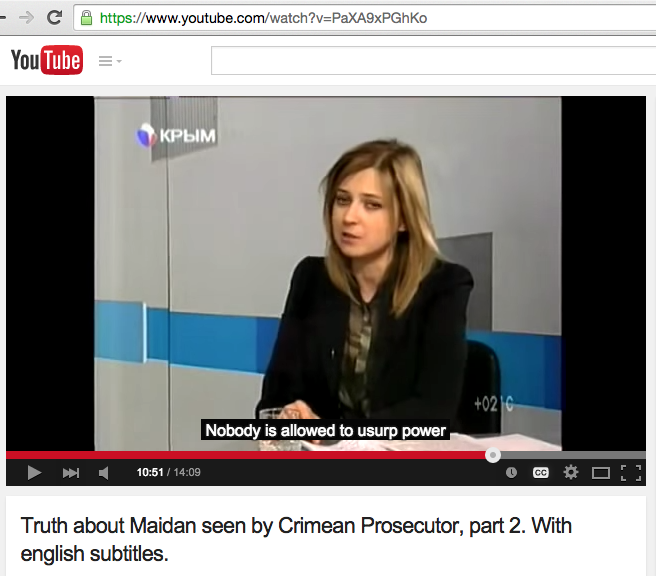 Little attention is generally paid to the connection between the February 2014 coup in Ukraine, and Crimea’s breakaway from Ukraine. The testimony that will here be cited helps fill this in. An attorney in the federal prosecutor’s office at the time of the coup refers to the longtime national socialist, Andriy Paribiy, as having been the key person behind the coup. In the new regime, Paribiy became appointed to become the chief of national security, and the top person overseeing the war against “ATO” ‘Anti Terrorist Operation’ to exterminate the residents in the formerly Ukrainian area, Donbass, the area which had voted 90% for the overthrown President Viktor Yanukovych, and which consequently rejected this new regime, which Washington violently imposed to replace him. 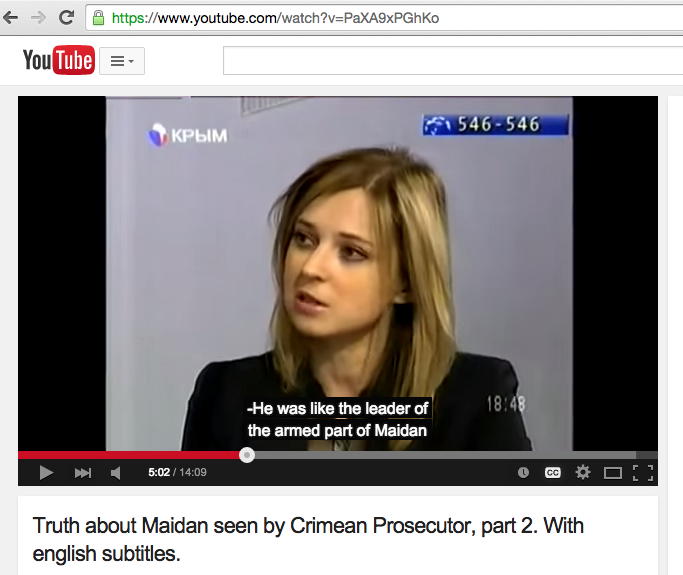 Below is a Crimean TV interview with Natalya Poklonskaya, who was a senior criminal prosecutor in Kiev at the time of the February 2014 Maidan demonstrations and overthrow of President Yanukovych, and who resigned her post during the coup and drove back to her childhood home in Crimea, because she objected to what she called “nazis” who, she said, had done the overthrow; she objected to the way that Yanukovych was replaced, and to the unconstitutional and violent nature of it, which she didn’t view as being a democratic action, at all, but instead a “nazi” one. 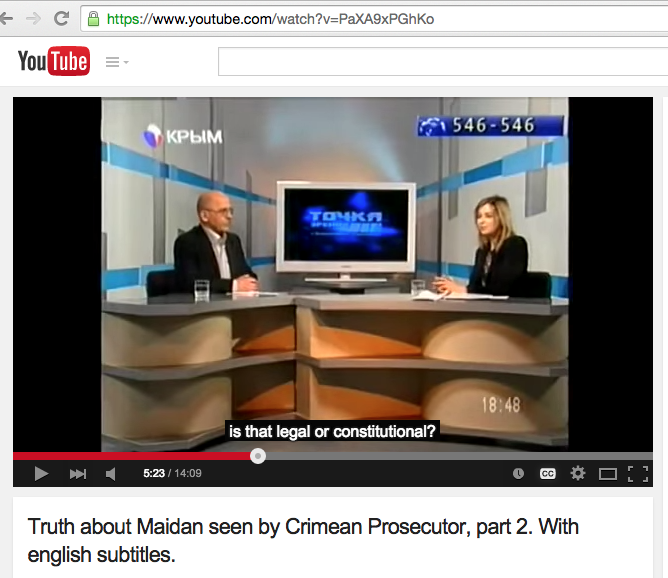 This interview was telecast shortly after the February 2014 overthrow, but before the March 16th referendum in Crimea on whether to reject the new Government and to rejoin Russia (of which Crimea had been a part during 1783-1954). 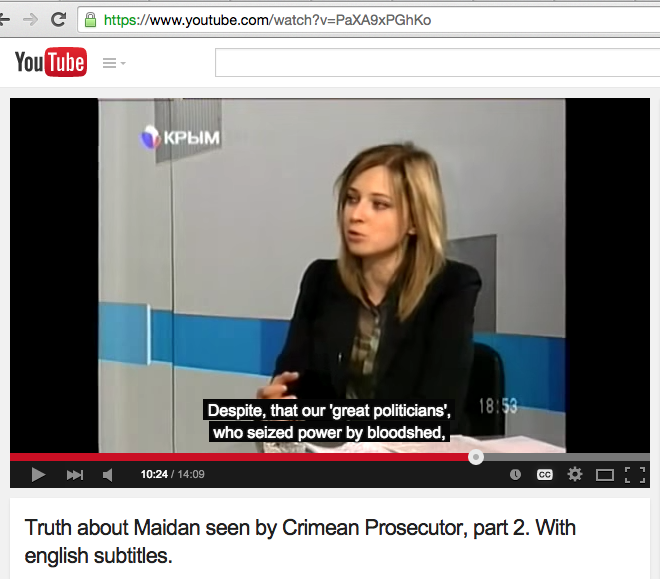 Poklonskaya was interviewed in this call-in live TV show so as to inform her fellow Crimeans what she had seen happen during the overthrow, and why she couldn’t, in good conscience, remain as a Ukrainian official in Kiev, and swear loyalty to the new Ukrainian Government there. She had heard the chants of the Maidan protesters and smelled their piles of burning tires, and seen their marches in Kiev with nazi symbols and salutes, and she didn’t want to become any part of that. 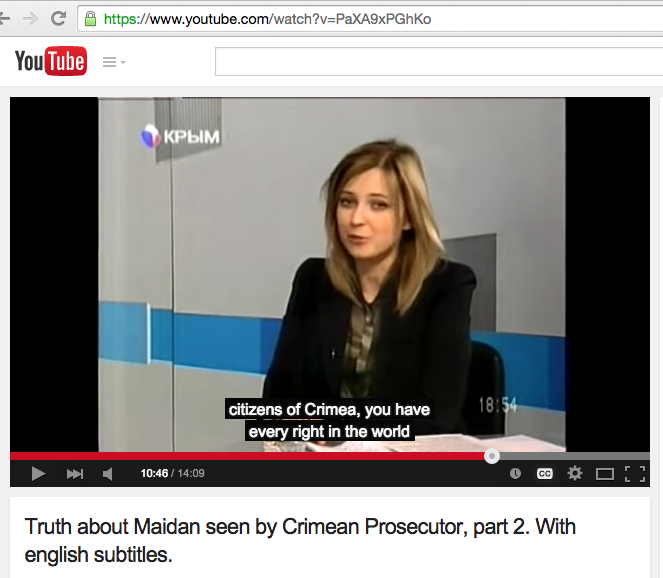 So, she quit and was now unemployed back home in Crimea at the time of this interview. The referendum took place entirely peacefully, because Russian troops from Crimea’s naval base in Sevastopol Crimea prevented an invasion from Kiev. The results were 96% for reunion with Russia. A 2013 Gallup poll of Crimeans, and also a 2014 Gallup poll of Crimeans after the referndum, both showed overwhelming support for Russia and opposition to the United States; and the 2014 poll also showed that almost all Crimeans thought that the referendum-results had been free and fair and accurately reflected the views of Crimenans. However, the United States Government, and its allies, claim that the overthrow of Yanukovych was legal and that the reunification of Crimea with Russia was not, and also that the ethnic cleansing against the residents in the Donbass region of the former Ukraine is legal and that the military assistance that Russia is providing to enable those residents to defend themselves from being exterminated is not. The United States Government, and its Ukrainian Government, call that extermination-program Ukraine’s “Anti Terrorist Operation,” and the United States is sending Ukraine weapons to carry it out. When the Crimean people voted to rejoin Russia when they did, they saved themselves from the fate that soon thereafter befell the residents in Donbass.